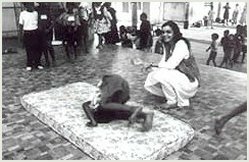 On June 3, 2007, Anita Ratnam conducted a master class for meditation students in New York City at the studio of QIGONG guru Sat C Hon. In the four hour session, Anita shared the discipline of Bharatanatyam mudras and the overarching design of specifics and exactness that is the hall mark of Indian classical dance. The workshop was attended by 15 advanced meditation students, ages ranging from 30 to 65, and was designed to include and encourage the parricpants who of Asian and Western descent. The participants learned pure dance phrases as well as the technique of facial expression to poetry. 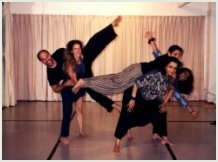 "My students loved your workshop and I was thrilled to have you present such an exquisite workshop." "As to the martial art, I have a sense that most of my students would not be interested in doing something so confronting. I realized that it was mostly my own interest as an martial artist. So we have to do something else."